Do I need insulated or uninsulated ducting? Can I reduce or change the size of the ducting? The size of the ducting is stated in terms of diameter, and is specifically designed for each cooling unit. The size of the ducting cannot be reduced or restricted in any way, and must remain fully open from start to finish, including any turns. Where should I place the cold-side exhaust and intake inside the cellar? We recommend placing the cold-side intake and exhaust in the ceiling where they will be unobstructed and receive unrestricted airflow. The exhaust duct always should be near the ceiling inside the cellar, whereas the intake duct can be located near the top or the bottom of the cellar, whichever is most convenient. If possible, we recommend separating the exhaust and intake so that the exhaust does not enter the intake and cause the cooling unit to short-cycle. Must I exhaust the hot-side exhaust to the exterior, or can I drop it into interior space? Either will work. Assuming the space outside the cellar is at least as large as the cellar, you shouldn't feel a significant impact from the hot air exhaust. The other consideration is noise, which should be relatively slight as the length of the duct run increases. Can I pull hot-side fresh air intake from exterior? How do I decide between Low RH vs High RH duct kits? 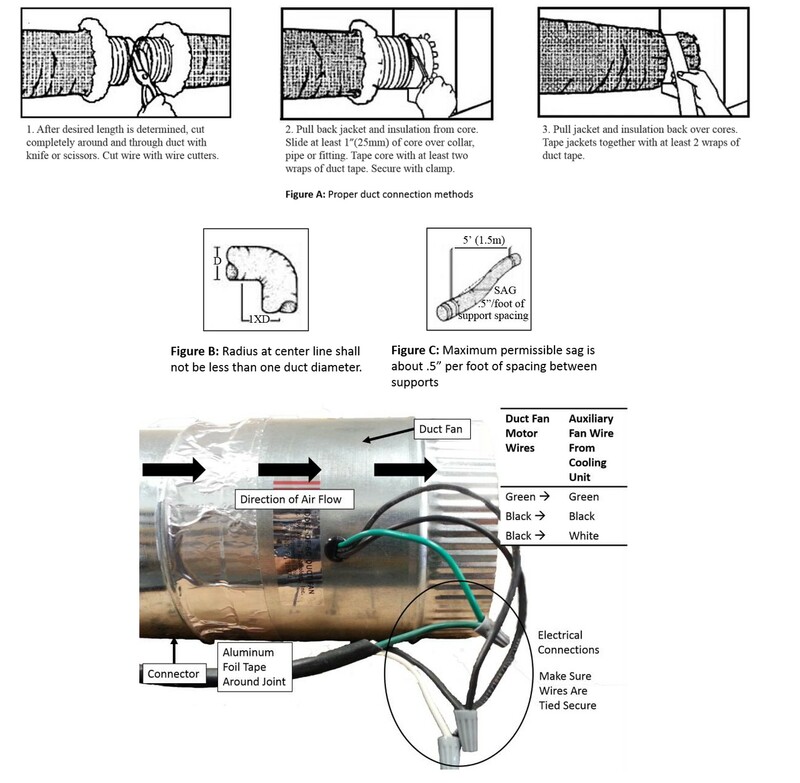 If you live in a humid or moderately humid location, you should purchase the High-RH duct kit, because it includes extra insulation on the front half of the cooling unit, as well as on the duct adapters, to mitigate the formation of condensation on the outside of the cooling unit. How do I know when the hood is correctly attached to the cooling unit? Inside the hood is a plenum that separates the hot-side air intake and exhaust. In order to work effectively, the hood must be pushed until this plenum comes into solid contact with the rear of the cooling unit, so that air bypass (from the hot-side exhaust to the fresh air intake) doesn't occur. How do I install rear ducting on 1800 units? Minimum size ducting is 6" diameter. Reducing the airflow will reduce efficiency and potentially damage the compressor. Attach the rear drain tube to the rear drain plug located on the bottom-rear of the unit, if ordered (optional). Place the rear duct hood behind the cooling unit, such that the two 1-1/2" holes are on the bottom. Thread the power cord and the auxiliary fan wire through right bottom hole. Thread the drain tube through the other hole (optional). Slide the duct hood over the cover of the unit, and use aluminium tape around all four sides. Aluminium foil tape, UL 273 listed with acrylic pressure sensitive adhesive, VentureTape 3520CW or equivalent is recommended. This is to prevent leaks and secure the connection between the hood and the unit. Install the ducting fully extended to maximize efficiency of the airflow, then trim any excess ducting. Always attach the duct fan on the exhaust side, so that it pulls the hot exhaust away from the cooling unit. Secure the connections by using a method which does not obstruct the flow of air (i.e. sheet metal screws, aluminium tape, etc.). Take note the direction of air flow. Since the fan is put on the hot air exhaust line, the air flow should be away from the unit. Attach the auxiliary fan wire cord to the ducting fan. Secure all three connections using the wire nuts provided. The intake should be able to hold a piece of cardboard when placed against the inlet with the duct fan running. If you have any questions, please contact our support team by dialing 877.726.8496 during normal business hours.